On October 16, 1859, abolitionist John Brown led an interracial group of men on a raid on the armory at Harpers Ferry, Virginia. Brown hoped to arm slaves and instigate a slave rebellion. The mission failed, and Brown became a villain in the South, but his trial and execution for treason made him a martyr in the North and inspired one of the United States’ most enduring national hymns. Long after Brown was gone, the melody continued to serve the mission. Augustus Washington, Portrait of John Brown, 1846-47 (without frame). Public domain. Nelson-Atkins Museum of Art, gift of the Hall Family Foundation. Brown’s commitment to abolishing slavery was longstanding. Following the Kansas-Nebraska Act of 1854, which stated that Kansas’s admission to the Union as a free or slave state would be decided by popular sovereignty, Brown and his family joined the flood of Americans who moved to Kansas, hoping to tip the scales. A series of armed conflicts between pro- and anti-slavery migrants ensued, with so much bloodshed that the years-long episode was dubbed “Bleeding Kansas.” In 1856 Brown participated in one particularly violent incident, known as the Pottawatomie Massacre. In retaliation against a pro-slavery attack, Brown led an anti-slavery group in killing five pro-slavery men by hacking them to death. Brown – like most assailants in Bleeding Kansas – evaded capture. In total, 200 people died over the slavery question in Kansas in the first half of 1856 alone. Brown’s reemergence at Harpers Ferry three years later was even more audacious – and consequential for the nation. Fourteen of Brown’s eighteen followers were killed, including two of his sons, and Brown himself was captured and tried for murder, conspiracy, and treason. A jury found him guilty and he was hanged on December 2, 1859. The failed raid and Brown’s execution divided the country. Many northerners – including most politicians and the press – condemned Brown’s violent methods, but some northern abolitionists held parades in Brown’s honor. Meanwhile, southern whites grew more fearful of a conspiratorial slave revolt supported by northern whites. The most profound historical consequence of the Harpers Ferry raid was its contribution to the coming of the Civil War (1861-65), as the divide between North and South seemed increasingly unbridgeable. In addition, Brown became an iconic figure in the North, where he represented not only the abolition movement, but also heroic martyrdom. Brown lived on as an important cultural symbol as the Union asked men and their families to, like Brown, make the ultimate sacrifice. At first this sacrifice was for the Union, but after the Emancipation Proclamation on January 1, 1863, more Union soldiers understood their sacrifice in terms of ending slavery. It is little wonder that a song with lyrics that hailed John Brown, the Republic, and the moral rightness of the cause became the Union’s Civil War anthem. Thomas Hovenden, The Last Moments of John Brown, 1882-1884, Oil on canvas. Courtesy Metropolitan Museum, 97.5, Gift of Mr. and Mrs. Carl Stoeckel, 1897. It was popular near Charleston, South Carolina – in free Black churches and on army posts. Once the Civil War began, the catchy tune – which made for an ideal marching song – found more pungent lyrics, such as “John Brown’s body lies a-mouldering in the grave. His soul is marching on!” and “They will hang Jeff Davis from a sour apple tree.” The earliest reporting of the new version described Union troops singing it as they marched through Boston on July 18, 1861. The revamped song, titled “John Brown Song” or “John Brown’s Body,” quickly spread through Union Army camps. The song spread throughout the country. Charlotte Forten, an African American writer and teacher, taught the song to black schoolchildren in South Carolina, and black regiments sang “John Brown’s Body” as they took the city of Charleston. From the beginning, the lyrics proved malleable as Union soldiers added verses. The next distinct version of the song, however, came not from army camps, but from writer, abolitionist, and future woman’s suffrage advocate Julia Ward Howe. While visiting Washington, DC, she heard Union troops singing “John Brown’s Body.” Howe penned new lyrics, which she published in the Altantic Monthly in February 1862. Her version retained the moral sensibilities of “John Brown’s Body” and the morale-boosting tune, but her lyrics were more poetic and infused with religious imagery. Howe’s version, the “Battle Hymn of the Republic,” became a lasting testament to the swirl of patriotic, religious, and moral convictions of Union supporters. Howe’s lyrics built on the metaphorical “promised land” of Canaan in the original version, and the confident “marching on” of “John Brown’s” lyrics. She added more religious imagery – “Mine eyes have seen the glory of the coming of the Lord,” and “He has sounded forth the trumpet that shall never call retreat” – but retained “John Brown’s” topical Civil War references. With lyrics about “the watch-fires of a hundred circling camps” and the call to arms, “As he died to make men Holy let us die to make men free” – the Civil War context is at the forefront. (ABC News footage of mourners singing can be viewed here, 4:26-4:53.) The song was also performed at Washington National Cathedral following the attacks of September 11, 2001. Although the “Battle Hymn of the Republic” – with Julia Ward Howe’s lyrics – remains in currency today, the song has also lived on in other versions. Perhaps most famous of the post-Civil War versions is “Solidarity Forever,” written in 1915 by Ralph Chaplin, a leader of the Industrial Workers of the World union. Amidst poverty and the persecution of striking workers, Chaplin saw a connection between nineteenth-century abolitionists and twentieth-century labor organizers – especially when a Socialist strike leader named John Brown was arrested on false charges. Chaplin’s lyrics reframe the song around the causes of unionism and workers’ rights – and replace the religious chorus with one that celebrates worker solidarity. Over the past century, the song has become an anthem for unions around the world. Pete Seeger and the Almanacs – strong supporters of the labor movement – perform “Solidarity Forever” in this 1955 recording. (For) the movement’s movin’ on! Two years later, feminist activists at the 1972 Democratic Convention sang “The Battle Hymn of Women.” At this historic convention, the recently-formed National Women’s Political Caucus – dedicated to “increasing women’s participation in all areas of political and public life” – nominated African American congresswoman Shirley Chisholm for president. This apparently spontaneous performance of “The Battle Hymn of Women” symbolically linked women’s political representation to past struggles while also affirming – through Tax’s lyrics – the unique challenges faced by women. The activists’ rendition made it into Sandra Houch’s documentary, The Year of the Woman (1973). This clip from the film shows Steinem and other activists singing Tax’s version. For over 150 years, Americans have invoked “John Brown’s Body” and the “Battle Hymn of the Republic” to bolster their cause. Howe’s lyrics – infused with poetry and religious imagery – and the song’s sing-able, march-like melody have contributed to the song’s lasting appeal. But it is the story behind the song – John Brown’s vision of abolition and Howe’s conviction in the moral rightness of the Union cause – that give the “Battle Hymn” its enduring resonance. 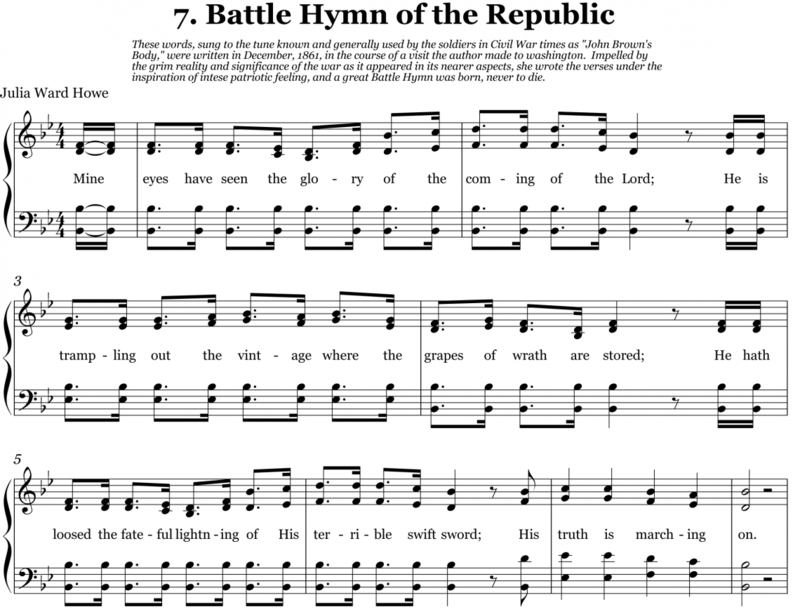 For more analysis of the “Battle Hymn”’s history and staying power, see John Stauffer, “The Song That Marches On: History of the Battle Hymn of the Republic,” http://www.historynet.com/the-song-that-marches-on-history-of-the-battle-hymn-of-the-republic.htm. Stauffer and Benjamin Soskis have also written a book-length “biography” of the song, The Battle Hymn of the Republic: A Biography of the Song That Marches On. New York: Oxford University Press, 2013. For a discussion of the “Battle Hymn”’s relationship to American wars, see Dominic Tierney, “‘The Battle Hymn of the Republic’: America’s Song of Itself,” The Atlantic, Nov. 4, 2010, https://www.theatlantic.com/entertainment/archive/2010/11/the-battle-hymn-of-the-republic-americas-song-of-itself/66070/. For more on the song’s early history, and to hear a medley of different versions, see Andrew Limbong, “How ‘The Battle Hymn of the Republic’ became an anthem for every cause” or listen to the NPR discussion. For printable versions of “John Brown’s Body” and “The Battle Hymn of the Republic,” as well as a choral performance of “John Brown’s Body,” see the Library of Congress page at http://www.loc.gov/teachers/lyrical/songs/john_brown.html. This Washington Post article discusses Howe’s writing of the “Battle Hymn of the Republic” and her husband – who supported John Brown but not his wife’s writing: https://www.washingtonpost.com/local/how-julia-ward-howe-wrote-battle-hymn-of-the-republic–despite-her-husband/2011/11/15/gIQAnQRaYN_story.html?noredirect=on&utm_term=.0abb3a1def24. Julia Ward Howe’s website explores her life and provides links to her writings and further reading, as well as related research topics. For more sources and links regarding labor movement songs see the University at Albany’s page, Songs and the Labor Movement. For more on Meredith Tax’s “The Battle Hymn of Women,” and for the complete lyrics, see https://www.huffingtonpost.com/entry/the-battle-hymn-of-the-republic-as-feminist-anthem_us_55b918e7e4b0074ba5a7318a. For more of Meredith Tax’s women-centric songs, see this section of her website: http://www.meredithtax.org/literature-and-culture/womens-songs. To read more about the documentary The Year of the Woman, see this Huffington Post piece: https://highline.huffingtonpost.com/articles/en/lets-go-full-crocodile-ladies/. For a detailed discussion of the raid on Harpers Ferry and its contribution to the coming of the Civil War, see Fergus M. Bordewich, “John Brown’s Day of Reckoning,” Smithsonian Magazine, Oct. 2009, at https://www.smithsonianmag.com/history/john-browns-day-of-reckoning-139165084/. The de Young Musuem in San Francisco has several paintings depicting John Brown that can be viewed at https://art.famsf.org/search?search_api_views_fulltext=%22john+brown%22. For more visual John Brown sources, including art and letters, see https://artsandculture.google.com/entity/m0k8cy. Nancy A. Hewitt and Steven F. Lawson’s Exploring American Histories: Volume 1 to 1877 (Boston: Bedford/St. Martin’s, 2017) includes an excellent document project, “Visions of John Brown” (p. 408-412) that explores various reactions to Brown’s raid and execution across the nation. For a document reader on John Brown, see Jonathan Earle’s John Brown’s Raid on Harpers Ferry: A Brief History with Documents. Boston: Bedford/St. Martin’s, 2008. See The Lost Museum’s page on the Currier and Ives Lithograph of Louis Ransom’s painting of John Brown: https://lostmuseum.cuny.edu/archive/john-brown-meeting-the-slave-mother-and-her. Brown’s life spawned plays, films, paintings, sculptures, and books. The West Virginia Department of Art, Culture and History has curated a select bibliography of John Brown in Print, Stage, Film, and Art: http://www.wvculture.org/history/jbexhibit/playsandbooks.html. For more on Brown’s time in Kansas, see the Kansas Historical Society’s pages on the Kansas-Nebraska Act, Bleeding Kansas, the Pottawatomie Massacre, John Brown, and the famous Louis Ransom John Brown painting. For primary items, see the Society’s pages on John Brown’s desk, John Brown’s surveying compass, John Brown’s receipt for horses (stolen from pro-slavery men), and John Brown’s pike. Additional primary sources from the society can be found here. Information on the John Brown Museum in Osawatomie, Kansas, can be found here: https://www.kshs.org/p/john-brown-museum/19574. Nancy A. Hewitt and Steven F. Lawson, Exploring American Histories: Volume 1 to 1877 (Boston: Bedford/St. Martin’s, 2017), 399; Fergus M. Bordewich, “John Brown’s Day of Reckoning,” Smithsonian Magazine, Oct. 2009, https://www.smithsonianmag.com/history/john-browns-day-of-reckoning-139165084/ (accessed Aug. 24, 2018). Hewitt and Lawson, Exploring American Histories: Volume 1 to 1877, 401. Sheet music dated 1862 lists the composer as George Barker, but William Seffe is also attributed as the composer (ca. 1856). The sheet music can be viewed at “Say, brothers, will you meet us? or Glory!, glory hallelujah,” Library of Congress, https://www.loc.gov/item/ihas.200000841/. The Library of Congress also attributes the song to William Seffe; see Battle hymn of the republic, Library of Congress, https://www.loc.gov/item/ihas.200000003/. “Battle hymn of the republic,” Library of Congress, https://www.loc.gov/item/ihas.200000003/; R. Blakeslee Gilpin, John Brown Still Lives! : America’s Long Reckoning with Violence, Equality, and Change (Chapel Hill: University of North Carolina Press, 2011), 57. According to historian R. Blakeslee Gilpin, dozens of Northerners took credit for the new lyrics. Gilpin, John Brown Still Lives!, 57; “John Brown’s Body/ The Battle Hymn of the Republic,” Library of Congress, http://www.loc.gov/teachers/lyrical/songs/john_brown.html (accessed Aug. 23, 2018). Gilpin, John Brown Still Lives!, 58. “John Brown’s Body/ The Battle Hymn of the Republic,” Library of Congress, http://www.loc.gov/teachers/lyrical/songs/john_brown.html; Battle Hymn of the Republic, Library of Congress, https://www.loc.gov/item/ihas.200000003/. David Rowell, “45 Years after death, recalling Robert Kennedy’s funeral train,” Washington Post, Jun. 6, 2013, https://www.washingtonpost.com/lifestyle/45-years-after-death-recalling-robert-kennedys-funeral-train/2013/06/06/5b058d60-ca03-11e2-9f1a-1a7cdee20287_story.html?utm_term=.2ee21ceab4a1 (accessed Aug. 24, 2018). Michael E. Ruane, “How Julia Ward Howe wrote ‘Battle Hymn of the Republic’ – despite her husband,” Washington Post, Nov. 18, 2011, https://www.washingtonpost.com/local/how-julia-ward-howe-wrote-battle-hymn-of-the-republic–despite-her-husband/2011/11/15/gIQAnQRaYN_story.html?noredirect=on&utm_term=.280fa9df1ea3 (accessed Aug. 24, 2018). John Stauffer, “The Song That Marches On: History of the Battle Hymn of the Republic,” http://www.historynet.com/the-song-that-marches-on-history-of-the-battle-hymn-of-the-republic.htm (accessed Aug. 24, 2018). Originally published in Civil War Times, Feb. 2015. John Stauffer and Benjamin Soskis, The Battle Hymn of the Republic: A Biography of the Song That Marches On (New York: Oxford University Press, 2013), 179. Liner Notes, If I Had a Hammer: Songs of Hope and Struggle, available at https://folkways-media.si.edu/liner_notes/smithsonian_folkways/SFW40096.pdf (accessed Aug. 24, 2018). Len Chandler, telephone interview with author, Aug. 21, 2018. Kate Auletta, “The ‘Battle Hymn of the Republic’ As Feminist Anthem,” Huffington Post, Jul. 31, 2015, https://www.huffingtonpost.com/entry/the-battle-hymn-of-the-republic-as-feminist-anthem_us_55b918e7e4b0074ba5a7318a (accessed Aug. 24, 2018). Ibid; “Early History,” National Women’s Political Caucus, http://www.nwpc.org/history/ (accessed Aug. 28, 2018); Douglas Rogers, “The troublemaker,” The Guardian, Apr. 15, 2004, https://www.theguardian.com/film/2004/apr/16/gender.usa (accessed Aug. 28, 2018).